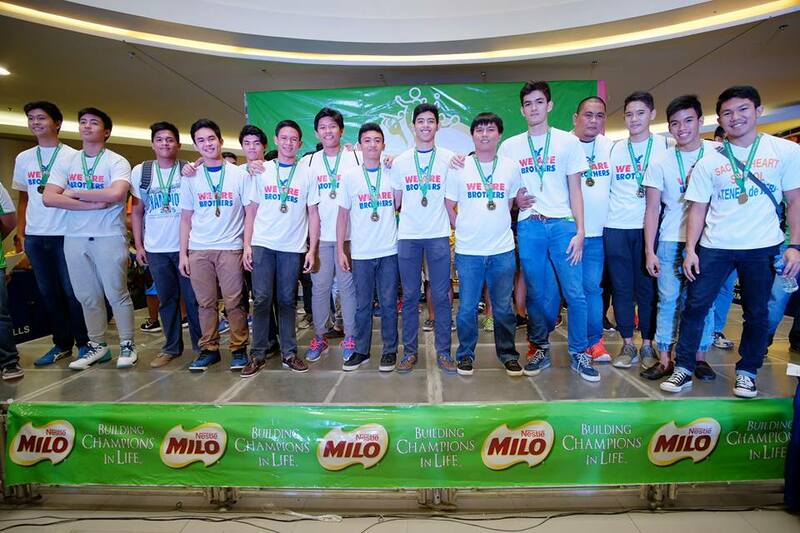 The Milo Little Olympics Visayas Regional Finals which ended last week was on its 20th edition in the year 2015. I’m not a numbers type of person, but “20 in 2015” does sound like a nice combo, doesn’t it? We didn’t give it much thought only to realize that the event itself brought out a number of surprising twists in many ways. For starters, the venue was moved to Iloilo City after 19 straight years of Cebu serving as host. When the dust settled and the over-all standings were tabulated, a new champion was crowned in the secondary division: Sacred Heart School-Ateneo de Cebu. After 17 years of dominance by the University of Cebu from Season 1 to 17, the University of San Carlos topped the 18th and 19th editions. And so the 20th produces a new champion. Our first reaction to the news was one of surprise and full of questions. When the sportswriters called us up to get our thoughts, I asked them if they were joking and pulling my leg. Then our Freeman reporter Caecent Magsumbol butted in, “Seryoso ni uy. Champion lagi ang Sacred Heart sa high school.” We were stunned and asking how this was possible. While we had been monitoring the performances of the teams that were in Iloilo, our guesstimate was that the school had a fair shot at a top five finish. After all, the school had never broken into the top five for the past 19 editions of the MLO; USC was always a sure bet with its deep bench coupled with the smaller delegation from UC and the presence of schools from Bacolod and host Iloilo. The mere presence of all these schools would be enough to spread and or share out the points that were up for grabs. But a blessing came the way of the Magis Eagles who also happen to celebrating a Jubilee year as the school turns 60 years old. So that’s “20 in 2015 for 60.” But how was the championship produced when the school sent a lean and mean team? The school joined eight out of the possible 24 events in the secondary (or high school) division with all eight teams delivering the much-needed points for the over-all championship. It was a team effort from all the teams that made the trip. Following the points system that the MLO applies, the boys swimming team won the team gold worth 30 points; the boys basketball produced 25 points as champion; the girls swimming team earned 20 points for its team silver; the girls athletics team had 20 points for its team silver; the girls volleyball pitched in 15 for their silver medal; the boys football team finished at third or 10 points; the girls lawn tennis was good for 7 points as the boys table tennis team was good for 3 points. This was good for a total of 130 points. Every team that competed contributed to the total performance of the school, thus the over-all championship. Over-all runner-up USC had nine teams/events delivering points for the school for a total of 107 points. But SHS-Ateneo de Cebu didn’t go there to shoot for the over-all title. The basic mission was to go all out in each sport and get the best possible finish. If an over-all championship comes with it, then that becomes a bonus for the efforts that the athletes, coaches, parents and supporters invested. Credit goes to the athletes and coaches for their diligence at practice whose fruits were evident in the over-all finish. Ditto for the parents and support staff who were crucial in providing the off-court needs of all athletes and coaches: from water to fruits, meals, laundry, transportation and accommodations. This was an excellent example of how total team and selfless effort will produce Jubilee-filled fruits. But that wasn’t the only story, SHS-Ateneo placed second to USC in the over-all standings with five teams deliver precious points. The grade school delegation earned 70 points from boys swimming (30), girls volleyball (15), boys football (15), boys lawn tennis (7) and girls lawn tennis (3). Unlike the secondary division, SHS-Ateneo had won the over-all championship once in 2009. The school would be good for top five every year since then. And in this Jubilee year, a team silver tastes like gold given the circumstances. Again, a top five finish would be acceptable according to set standards vis-à-vis the delegation sent to the meet. Like their older counterparts, the battle cry was to go all out, give it their best and everything else will follow. In review, does this mean that SHS-Ateneo de Cebu can now match up against the likes of UC and USC? This is where we have to tame down any expectations. The school is far from being a sports “power” as its programs are still in their development stages. There are a lot of things that still need to be done to put in place a long-running institutional program for sports. Any wins that come along the way are most welcome and considered as bonuses. Moreover, the winning of multi-sport events isn’t the primary objective of the school’s sports program. Sports will always be in place as part of the holistic development thrust of its students. And it isn’t all about winning competitions. Sports must also be managed to promote the need for a healthy and active lifestyle and as a way to build the community. Should all these elements fall into place, then one can say that a school truly has a complete sports program that works.